It's bad news all around - banks are failing, yet their executives are still getting big bonuses and buying private jets (glad that's not just in Ireland! ), the economy is in bits (I just read that employees at a four-star hotel in Limerick found out they were losing their jobs when they turned up for work and found the doors closed! ), our Taoiseach Brian Cowen doesn't seem to be doing anything, except look annoyed with the people of Ireland for not trusting him, and to top it all, the weather is miserable, going from wet and windy to cold and grey. But you can always find a ray of sunshine with Google. I read about Google Trends in Newsweek a few days ago. Google Trends enables you to conduct your own marketing survey about anything you want, and find out what people around the world are searching for on the web, an indication of what they're interested in. For instance, if you type in dublin, london, paris, you'll find that, worldwide, Dublin is bottom of the league, and London is slightly ahead of Paris. But then you can drill in by country or by language. Or if you type in neil diamond, joe jackson, you will find out that, yes, Neil Diamond is more popular than Joe Jackson! Now, there is obviously some fine-tuning still to be achieved, as I found that some of the Joe Jackson references are actually about Michael Jackson's father! You can search all years (since Google records began, of course) or specify a tighter time bracket, and you can search by country if you want too. The article in Newsweek was saying that you could use Google Trends to find out if pink will be the new black this spring. We did a search comparing black dress vs blue dress vs red dress, and yes, black dress comes on top, followed by red, with blue in 3rd place! I just did a new search, adding pink to the mix, and it comes last. Don't say I didn't warn you! Google have got a new tool for creating websites. It's still at the experimentation stage, based on my experience, but I'll keep an eye out. When I added a picture, I thought it would automatically resize it like it does in blogger, but not so. I must go and have a look at that again! 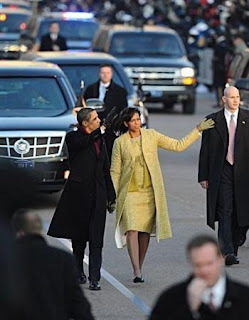 Powerful speech, emotional swearing in, a million people, a black President and First Lady, Hope for the world - all good. I signed up for a week-long summer course in Colour Theory in the NCAD in the summer of 2004, but I found it too boring and didn't attend after the first day. Maybe I should have stuck to it, or maybe I should have got myself a good book about colours instead. I have such a book now, Blue and Yellow Don't Make Green, and I'm actually enjoying it. It tells you how to mix bright colours, not mud! It follows the same principles as what I picked up on that one day in the NCAD, i.e. you need 2 yellows, 2 blues and 2 reds in order to create bright colours, but the reasons why are very well explained (if a bit repetitively). So, I spent a bit of time mixing colours this afternoon, greyed violets and bright violets. I should have allowed myself more room at the blue end. Maybe I should do another series with the same basic colours, and start the mixing with the blue instead of the red! Went to see Slumdog Millionaire with Susanne last night. The Screen 1 on D'Oliers Street was booked out, so we were glad Susanne had booked the tickets in advance. We reacted to the movie very differently. I found it a feel-good movie, with an uplifting ending, whereas Susanne was shocked by the poverty and the violence. It's great that a movie can provoke such opposite reactions. It was made by the director of Trainspotting and Shallow Graves, so plenty of fast-paced camera work, and an eye for beauty in even the most horrific moments. Dev Patel, of Skins fame, was great as Jamal. And the little boy who plays Jamal in the first part was fantastic too. And a wink to Bollywood for the closing credits, for me, wrapped up the movie nicely. And when I got home, at about 11:30, 9 to 5, with Dolly Parton, Jane Fonda and Lily Tomlin, was on the telly, so we stayed up until 2 am to watch it. It's a long time since I was up so late! Here is the finished article. I am happy with the shading, and the fact that they look like peppers, i.e. they are 3-dimensional objects. The colours are a bit duller than I would have liked, but I thought that if I added any more glazes, I would make the painting muddy. I'm reading a book on colour theory, and I now realise that I don't have good yellows in my watercolour palette, despite having 6 different tubes. So, my oranges and greens don't come out as good as they should. Mind you, I'm pretty happy with my vanadium yellow from the Schmincke brand (PY184) - with Phthalo blue, it creates vibrant greens. Green is always a difficult colour, and one for which none of the ready-made mixes have the vibrancy and the freshness of a new spring leaf. 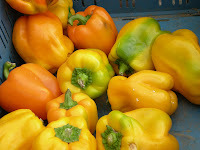 I must now find the Hansa yellow mentioned in the book, just to see how good a green it gives. I went to the Art & Hobby store in Dundrum, but they don't have it. I must try Nimble Fingers in Stillorgan or, better, Kennedy's in Harcourt Street, next time I'm in town. I love Hello Kitty. It's no secret. And my nieces have grown to love it too! I suspect Véronique has caught the bug now. Originally, she only started looking at Hello Kitty knick knacks for me, as Japan has a much better selection than Ireland. Over the last couple of years, she has bought goodies for me in Japan and sent them over, so I could have original presents for my nieces' birthdays. I've given most of these away, although I have to admit I'm holding on to a few prized items, such as a knitted red handbag, which I think is absolutely gorgeous, but will never be able to wear in the outside world of course. Some day, I'll have to part with it, but by that time, all my nieces will be too old for it too. I might as well keep it, so! Now, Véronique has actually sent me pictures of items she has seen in shops, knowing well that I would not be able to resist them. How could I resist these cozy slippers, for instance? Once I had seen a picture of them, I had to have them! And I have no intention of giving away the paper clips, Japanese-style writing paper, and stamps either! Miserable weather this afternoon. After a sunny morning, the wind and rain have come in from the West. Storm force winds of 120km/h are forecast, with peaks of 140km/h in the North West. The perfect afternoon to drink (green) tea and eat (wheat-free) biscuits. I baked my favourite Aine McAteer chocolate chip cookies last night and we've just had a couple with a nice mug of hot green tea (coffee for Brendan). I've been drinking green tea for the last year or so, when I realised that, contrary to regular tea, it doesn't give me migraines. The wheat-free is a new thing for me. My GP has recommended a wheat-free and dairy-free diet as a possible way to control my asthma. I'm on various inhalers, and my asthma is well managed - no attacks in years. But I'm interested to find out if cutting out wheat and dairy can make a difference. So far (it's 2 weeks), I haven't noticed anything, but I'm prepared to try it out for 3 or 4 months and see what happens. These chocolate chip cookies are baked with splet and rice flours, but you wouldn't know it. They are delicious. Pizzas are out, that's no harm. Pasta is out, but we've found that rice noodles work quite well. I'm not a big bread fan anyway, so I don't miss it. I miss the cheese on my baked potatoes at lunch time, but I've replaced it by lots of mayonaise. And I had already switched to Oatabix and rice milk a few months ago. We were down in L'Officina in Dundrum last Friday night for a quick bite, and I was fairly restricted, but they had a few specials without pasta or bread, including a very satisfying beef stew. So, no big hardship, as long as I'm not planning a holiday in Italy! There is a Turner exhibition at the National Gallery this January. It's free and it's well worth seeing. I think there are about 30 watercolours on display, and some of these are really gorgeous, though I suspect somewhat faded. They are much smaller than I expected, and there is a variety of styles, from tonal studies with grey and blue paint only, to really detailed ink and watercolour landscapes, and also abstract studies of big skies and rain. A pity that there are no pictures of it on the National Gallery website, apart from a disappointing, faded study of sky. There are some good pictures on this website, but unfortunately not many watercolours. I have finally put paint to paper, and here is where I am with it: after covering the highlights (I used a Masquepen, with blue masking fluid), I applied 5 or 6 glazes, starting with Cadmium Red Pale Hue (which gives quite a vibrant orange), and Phthalo Blue (a good basis for greens) for the darker elements. 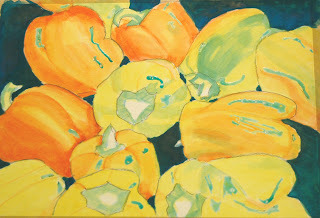 Then, I added good strong glazes of Aureolin yellow. The shapes are starting to come out now, and I realise I'm going to need more red and blue glazes for shadows to give each pepper a more 3-dimensional feel. I'm still re-reading old books (by the way, thank you to Mary and Françoise for your book suggestions - I got some of these for Christmas, and I'm looking forward to reading them!). I have just finished "What I loved" by Siri Hustvedt. And you know what, I'll hold on to it and will probably read it again in a few years time. It's set in New York and follows the lives of 2 couples and their sons. It's got a lot in it - separation, bereavement, disfunction, love, but what hooked me in this book is the art. One of the characters is an artist, and he creates these fascinating paintings and installations. Some of his installations are boxes with letters of the alphabet or numbers, others are a series of doors and what's behind those doors. It's very well described and it makes me want to see the actual pieces of art, as is they were real. And there is depth in each and every one of the people in the book. Which tugs at your heart when something happens to them. Actually, I have another book by Siri Hustvedt, The Blindfold. I must re-read it too, and look out for others of her books. Siri Hustvedt is married to Paul Auster, another author I'm planning to re-read, and she has a blog on migraines, which I'm going to have a look at now! I've been pretty low on energy this week. I'm sleeping 10 hours a night, and I still don't feel like doing much. I guess I still have a bit of that cold, and we've been pretty busy workwise, too, and the weather has been cold, so that's my excuses anyway! All that to say that I haven't done much on my current projects. In acrylics, I have been trying this technique by which you paint acrylic gel medium over a photocopy of a picture, and you're supposed to be able to peel the paper off and have a clear acrylic sheet with the picture, but my attempts don't look great. If I peel too much of the paper, the ink comes off too, and the picture is muddy. And if I don't peel enough of the paper, the whole thing lacks transparency. I must try this some more. I can see how it could look great, but I don't know what I'm doing wrong. Maybe the paper I use is too thin, or the ink isn't strong enough. I'm using a photocopy from my all-in-one printer, not from a big photocopier. Or maybe I should let the photocopy set for a day or so before I apply the acrylic medium to the paper? I need to research this on the web before I try it again, or I'll just lose patience with it. And I'm also working on a watercolour. 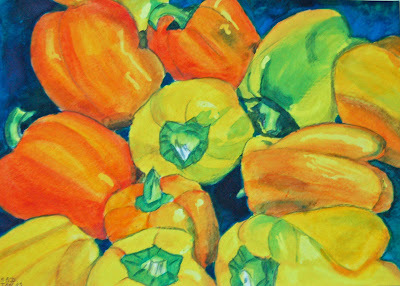 It's based on a gorgeous picture of yellow peppers that Brendan took at a farmers' market a few months ago. I've traced the picture, and I've applied masking fluid and I've tried out my colours, but I'm holding off from putting paint to paper. I want my peppers to really shine through and I'm worried they're going to look dull. So I'm putting it off. In the meantime, we've watched 6 episodes of Buffy the Vampire Slayer. Which has been fun I have to admit. We always get a few DVDs for Christmas. Last year, I got a few Chinese movies from Brendan. Most were good, except The Emperor and The Assassin, the last one we watched. It was badly edited, the story wasn't particularly compelling (though it is the story of the unification of China, quite a common theme in the movies we've seen), the acting wasn't great and the costumes and sets were not half as glamorous as in House of the Flying Daggers. And now, we have this year's crop of DVDs: a full set of Buffy the Vampire Slayer (a present from Brendan for our anniversary), There will be Blood, and Iron Man. Iron Man turned out much better than I thought. I was expecting a standard comic-to-movie transposition, like Spiderman and many others, with two-dimensional characters, but it offered more than those. It stars Robert Downey Jr, Gwyneth Paltrow and Jeff Bridges (hardly recognisable though he is, with a bit of fat around the girth, a bald head and a beard!). Good story, plenty of fire power, a hint of romance, good versus evil, terrorist plots, fast cars, sharp one-liners, characters who have a little bit more depth than you'd think (well, just a little bit), all good ingredients. It's light, but perfect for watching over the holidays. This is another acrylics experiment inspired by Alice Teichert's paintings. I used pouring medium mixed in with blue acrylic paint to do the writing. Again, it's not even a pale imitation of the original, but it's the kind of style I would like to develop. 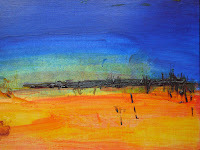 I called my acrylics experiment "Australia" - red earth, big intense blue sky, a lot of emptiness. 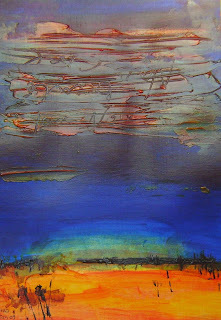 The top part was achieved by adding a bit of structure gel with a knife, mixed with yellow paint, and then painting glazes in blue and red over it, dragging the brush over the relief to uncover the original layer. Before the gel dried, I dragged a stick through it, and I wrote a few words. Unfortunately, the structure gel is quite shiny, and it stands out thickly from the canvas paper, so there is too much contrast with the other half of the painting. In retrospect, I should have applied a thin layer of gel as a foundation for the whole thing. The bottom is probably the best part - not as shiny, though I did use some structure gel for the yellow at the bottom, and for the dark hill shape in the middle ground and the grasses at the front. I'm not sure about these acrylics. On the one hand, they are great fun to work with, the colours are really vibrant, and there are all these different texture mediums you can play with. On the other hand, I feel like I'm learning the basics again, experimenting with paints rather than producing a proper painting. In some way, I feel they are a distraction, but they are so appealing it's hard to resist. They are definitely more immediate than watercolours - with watercolours, you need to plan a painting, whereas acrylics are more intuitive. 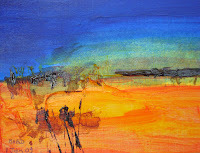 But, I feel I need to plan paintings, rather than apply colours to canvas without much thought. A real dilemma, all this. But, let's not think too much about the pros and cons. What matters to me is the process, more than the end result. I've spent the last couple of days trying to copy paintings by Alice Teichert, in "The New Acrylics". Trying being the operative word here. First of all, nothing like the size of the original, and nothing like the talent of the artist. This is definitely a painting of two halves, with a very rough transition between the top and the bottom. Maybe I should cut it in two?